Happy St. Patrick’s Day all ~ Hopefully you remembered your green, but, if you are like some I know, you don’t mind the pinches you get for not 😀 Today is a super busy day at work as I am responsible for hosting our fun today. I LOVE it, but, it can be quite demanding. I started my day off with a little Gentle Hatha Yoga #1 from yogadownload.com so I would enter my day in the right mindset. It felt so good because I am surprisingly sore from mowing all those lawns yesterday. Note to self, must work out more because mowing lawns shouldn’t make me sore. I had wanted to present you all with something “GREEN” for breakfast, but, nothing came to mind. I was up early to do Yoga, then, off to the grocery store to get stuff for our GREEN punch then to Starbucks. My cup has green on it, does that count? Breakfast did not come until later as I had to run around setting up everything to get the day started. 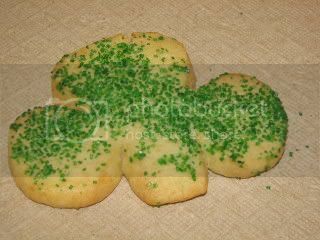 When my co-worker offered up one of her freshly baked sugar clovers, how could I resist (my stomach was totally growling). Who says cookies can’t be a pre-breakfast snack?! 😀 It was good! After I made the rounds, I went to the kitchen to set up breakfast. 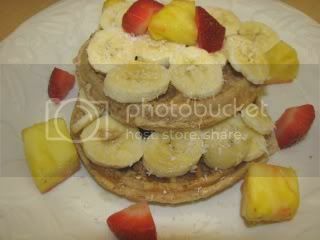 Today I made Banana Stacker Waffles. These were surprisingly tasty and not too fancy for a busy weekday. Tadahh! I had this with a Tall Nonfat Decaf Latte from “Bucks”. I scarfed all this down fairly quickly and it has kept me full all morning long. Then again, I haven’t had the chance to sit down much. Coming up next and throughout the day I will be sharing with you all the fun stuff we have going on at work today. I hope you all have a fun filled, green kind of day!